The Schmidt factory in Jersey City, NJ, tagged its best guitars with the 'Sovereign' label. The level of workmanship and quality of materials was notably higher than on their more mundane catalog offerings. The Sovereign line from OS is sought after today by both players and collectors. This example is one of the best we've seen in terms of condition and originality. 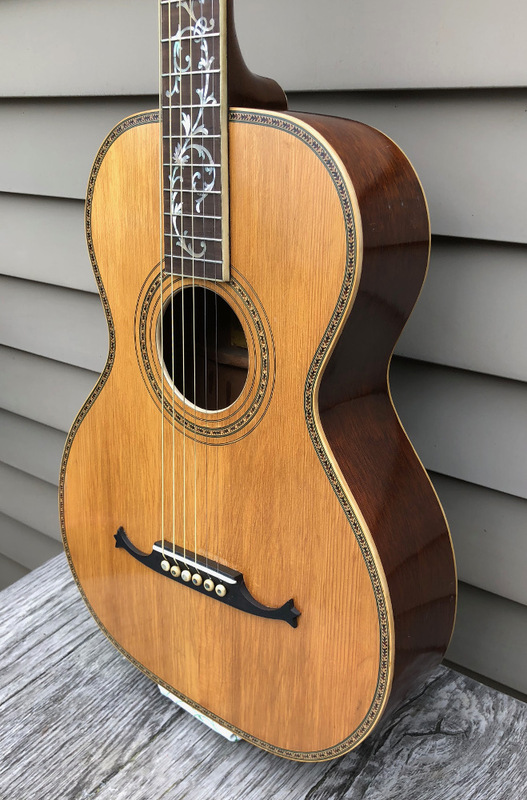 It's loaded with all the bling that the factory offered at the time including the fancy 'Leadbelly' marquetry, the 'mustache' bridge and the 'tree of life' fingerboard inlay. The top and sides are a nice mahogany, and the top is red spruce and ladder braced. 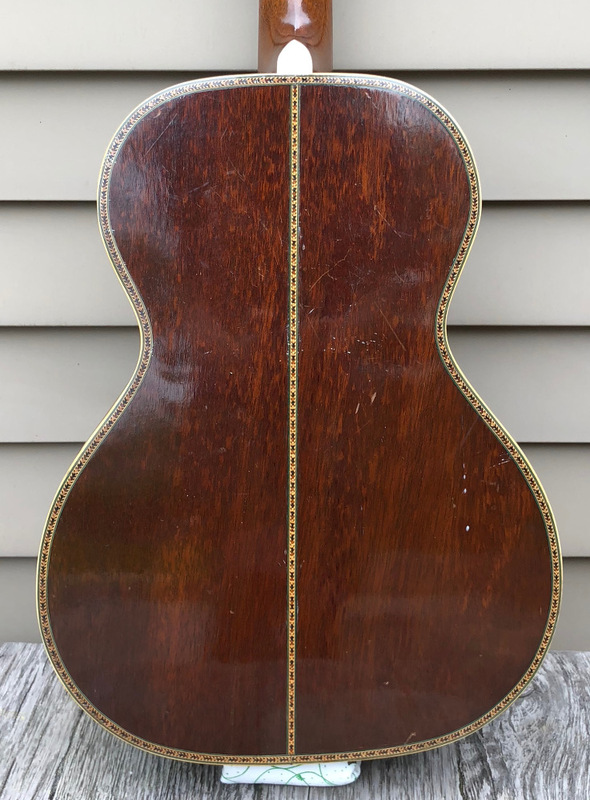 The neck is mahogany and carved in more of a 'C' profile, as opposed to the more common 'V' found on the bulk of the 'Stella' line. The headstock overlay is Brazilian rosewood with a Sovereign metal plate tacked on with small brads. The fingerboard is ebonized maple and is bound in white celluloid. Inside is a yellow Sovereign label. An added bonus are the likely original bone bridge pins with abalone dot inlay. Overall, the guitar is very clean and sparkles like new. All components are original but for a missing end pin. The finish is unmolested and there are no cracks evident anywhere. 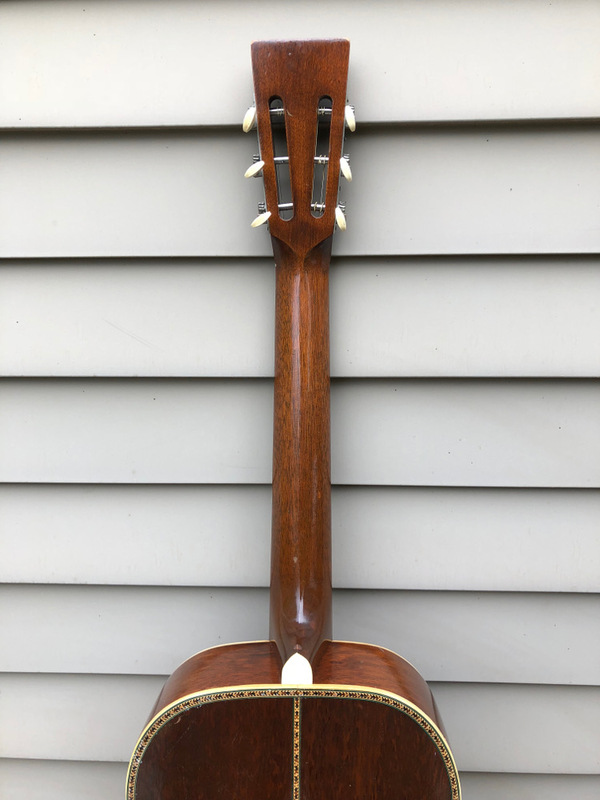 The bridge was partially pulled off and cracked in half when we received the guitar, so we removed it, patched two small bolt holes, and leveled any torn spruce on the top. An exact reproduction bridge was crafted from ebony and installed with hide glue. The neck was removed and reset, with the action at 5/64". The frets were leveled and dressed. A thin bolt through the heel was removed and the heel plugged with mahogany. The frets are in excellent condition likely because the guitar was set up with a nut raiser for lap slide playing. This is a 'concert' size guitar and measures 13 1/2" across at the lower bout. Scale length is 24 13/16". 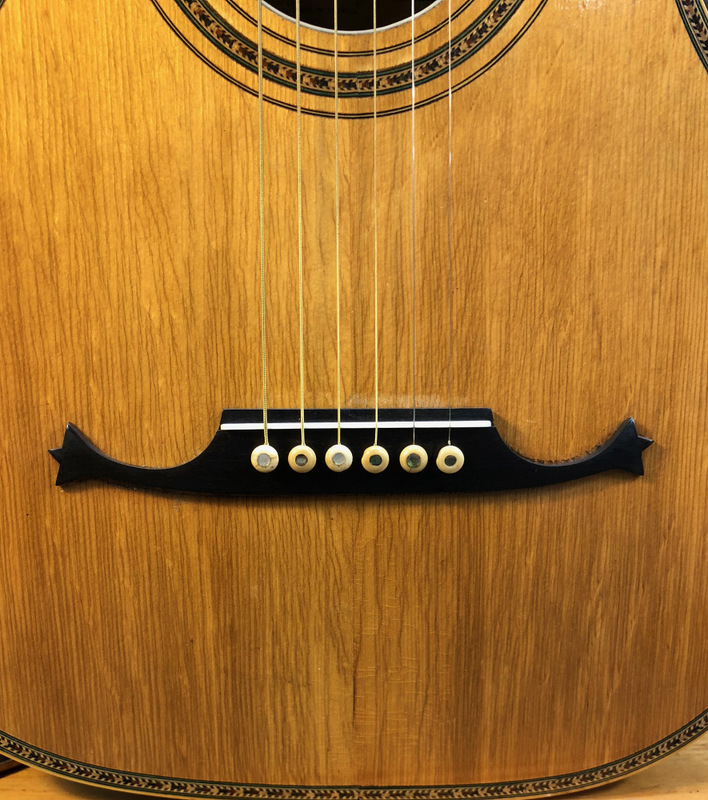 The neck at the nut measures a tad under 1 3/4" and string spacing is 2 1/2" across at the saddle. 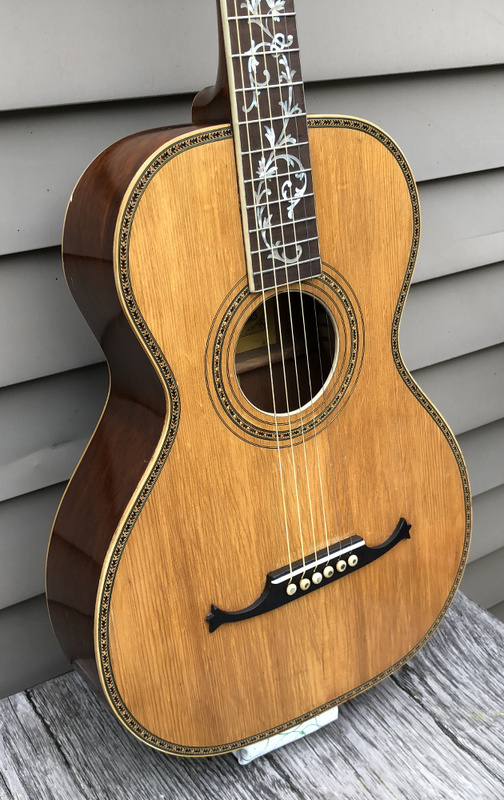 The guitar plays with a nice smooth action, and strung with extra-light bronze strings it produces a full, warm tone with a bit more subtlety than its Stella cousins. 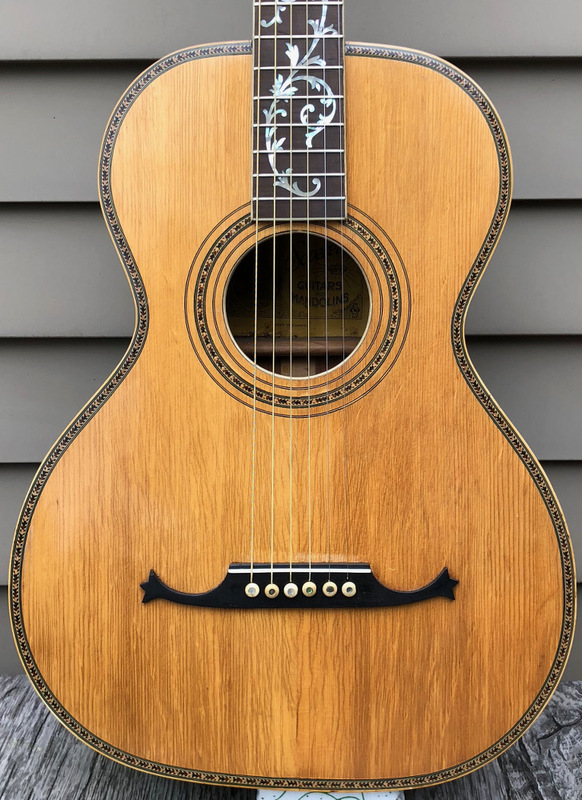 This guitar could appeal to a player of blues or old-time, or a collector looking for a prime example from the venerated Schmidt factory.